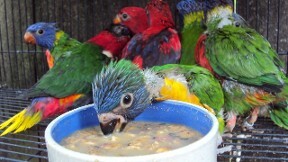 The following videos are demonstrations on handfeeding Lories. The top left starts out with youngster that is a day old. The subsequent videos advance in the ages of the chicks. The last video is how to tape a chick's foot it the toes start to go in the wrong direction.